A lot of people tell me that they’ve never had a plant in their house and the main reasons are, they don’t know how to look after them or they're not green fingered and often kill them. I can assure you, I am not a plant expert in any shape or form. But somehow, I’ve managed to keep them alive and I've gone from having 3 plants when I moved into our house, to around 30 and counting! 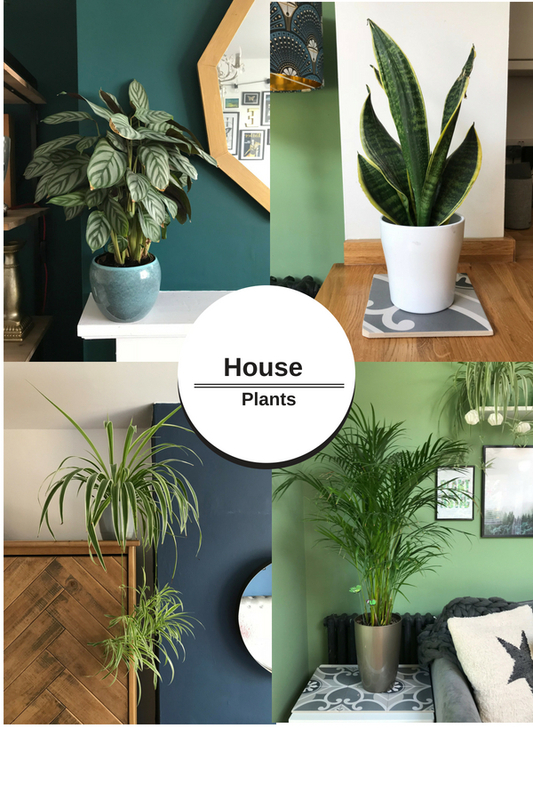 Here is a selection of the plants in my house which i find very easy to look after and if I can do it, you can too! One of the easiest plants to care for, the Peace Lily is great for cleaning the air as well. They mainly consist of dark green leaves and white “flowers” (although they look like flowers, they are actually white leaves). I find this plant the easiest to look after as it will tell you when it needs watering, no joke! They are far more tolerant of under-watering than over-watering, so you shouldn’t water on a schedule. In fact, I wait until the leaves start to droop before I water, a great reminder! Another fabulously easy plant to care for, I absolutely love my spider plants. My first plant came from my Mum in the form of a “baby” from one of her plants and it’s grown into a bit of a beast! They are very robust and can take a lot of abuse, which is great for any newbie indoor plant enthusiast. They like a light room, but cool temperatures and as the light increases over the spring months, they can flower and produce babies, or spider plant spiderettes which you can repot and grow into another spider plant! I currently have 5 in my house and that number is growing! The fern is a must have houseplant in my eyes. I love the way it grows and trails over a shelf or cupboard and it is constantly reinventing itself! They are a little more difficult to look after however! They’re not as fickle as the previous plants, their environment must be spot on. They have to be in a cool place, no direct light and high humidity. I find that they thrive in my bathroom! The best way to care for these plants is to make sure the soil is always damp and to spray them with water once or twice a week, especially in the winter when we tend to have our heating on and the air can get very dry. Happy Harry (yes, he has a name) sure likes a house party! These are quite expensive plants, so a lot of people purchase them when they are small and watch them grow to over 7 feet! I bought one that was just over 3 feet and has grown considerably since then. I love the almost tropical, botanical feel these plants give and I think they are a fabulous addition to any home. They need bright, indirect light (the leaves will start to brown if you put them in the sun) and water them enough that the soil stays slightly damp in the spring/ summer months and slightly dry in the cooler months. This is a hugely tolerant plant, so great for beginners. It is a slow grower and very good at being forgotten about 😊 They can thrive in low light and drought, but you want to look after them, don’t you? Don’t put them in direct sunlight and water them just enough so that the soil becomes dry in between. In return, they will help keep the air in your home clean and remove toxins! He needs a water fight! And finally, if I haven't convinced you to go and buy a plant today, you can always introduce the outside into your decor. We are lucky enough to have bifold doors in our kitchen and on a sunny day, there’s nothing better than opening the doors and letting the garden become an extension of the kitchen. This room used to be painted white until recently, when I decided to go green and paint it Cool Pine by Valspar and add shelving with plants on it. It now feels very homely and calming and has become more of a “garden” room than a kitchen. For the finishing touches, I added a few botanical print cushions and art work and always like to have a fresh bunch of flowers on the table.